At 6962m, Aconcagua is the tallest mountain on the American continent; in fact, it is the tallest mountain in the world outside of the Asian Himalayas. It is also one of the peaks that make up the "Seven Summits" tour, which consists of climbing the highest mountain in each of the world's continents. Aconcagua is seen as an essential stepping stone for those with eyes on the largest prize – Mount Everest. Due to the relative simplicity of the routes to the summit, Aconcagua also attracts a number of fairly inexperienced climbers who come to sample the thrills of high altitude. Regardless of the route chosen, what makes this mountain so challenging is its high altitude and potentially extreme weather conditions which place physical and psychological pressures on any climber. Although crampons and ice axes will likely be needed to ascend this mountain it is still classified as a trek as it actually requires little technical skill. The prize for one's hard work and dedication is to stand on the highest peak of the Western and Southern hemispheres, and the highest trekking peak in the world. Getting to the top of this mountain will enable you to fully appreciate the surrounding peaks and experience the breathtaking views of the amazing Andes mountain range. In the last season, more than 7000 visitors from all over the world entered the Aconcagua Provincial Park, a large portion of them trying to reach this sought after highest point. Although there are hundreds of mountains in the world which are higher than Aconcagua it must not be underestimated, for it can be bleak and unforgiving with merciless winds and biting temperatures. Well experienced mountaineers who have climbed many of the highest peaks in the Himalayas regard Aconcagua as being more of a challenge, due to its harsh conditions. Many who attempt to reach the summit of this peak are forced to turn back and descend. Trekking for long distances over uninhabited, barren landscapes in complete separation from the world back home, undoubtedly has its effect on climbers, and on top of the physical strains of such an expedition, it is that which makes this climb so incredibly jarring. Very good physical fitness, proper acclimatisation, good logistical support and the leadership of an experienced guide all help increase the chances of success on this formidable mountain. The relative distance between Aconcagua and the equator is a factor in the causes of its severe weather patterns. Moving further away from the equator thins the earth’s atmosphere, with this obviously having a greater impact at altitude. Aconcagua is located entirely within the Republic of Argentina in the Province of Mendoza, only 9 miles from the Chilean border. This region of South America is fairly civilised, with a good transport infrastructure in place and friendly locals. There are many other visitor attractions in the area if Aconcagua is to form only part of your trip. There are the vineyards of Mendoza and Chile, opportunities for white water rafting, the beaches of the Chilean Pacific coastline, rodeo shows and other cultural hotspots. Argentina is not a third world country so prices are higher than in Nepal for instance but considerably less than in Europe or the United States. The Aconcagua Provincial Park where the mountain is situated is located 110 miles west of Mendoza City. It was given Provincial Park status in 1983 and is one of the eleven protected areas of Mendoza’s province. Protection is deemed necessary to guard the many natural treasures contained within the Park, primarily its valuable fresh water resources, which are contained in glaciers and river headwaters. In a naturally arid area this supply of water increases the Park’s importance, as do the unique archaeological sites that it contains. These precious finds helped plan a famous route called Qhapaq Nan, or the Inca Trail, which stretches from Colombia through Argentina to Chile. The trail passes through seven provinces of Argentina, with its southernmost limit in the province of Mendoza. Covering approximately 71,000 hectares of land the Provincial Park offers protection from development to a large area of the Central Andes and helps to preserve the spectacular landscape of the region. 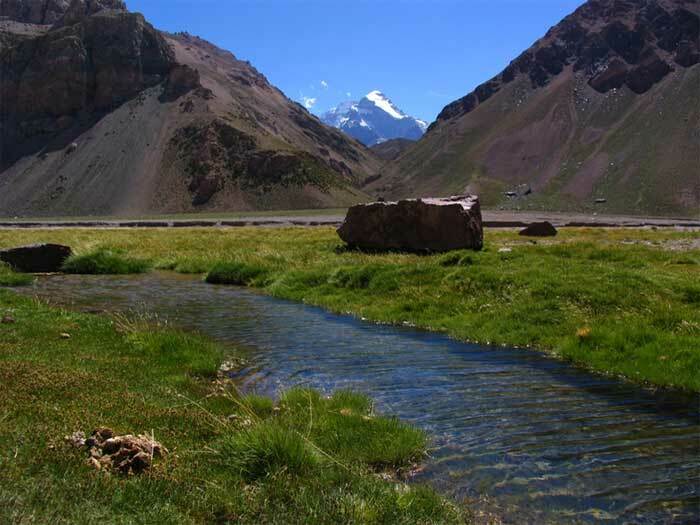 The Aconcagua Provincial Park offers a landscape of immense mountain peaks divided by long, deep valleys with vast open spaces. The height of these mountains makes the rivers fast flowing and they are a reddish brown colour due to the strong currents that churn up the river bed as the water courses its way forcefully through this stunning and peacefully idyllic setting. The Park is directly off the main road that links the cities of Mendoza and Santiago in Chile. The road is one of 13 passes over the Andes mountain range but this is the only one that is paved. The Park endures severe weather conditions which are accountable to the high altitude location where it is based. The biodiversity of the area is lower than an average National Park but where life is thriving it is particularly fascinating to naturalists because of its apparent ability to adapt to such a harsh climate, as well as to the lower oxygen level that is prevalent at high altitudes. An ascent of Aconcagua will undoubtedly start from one of the two villages bordering the entrance to the Provincial Park, either Puente del Inca (2700m) or Los Penitentes (2580m) which is a busy ski resort during the winter months. The Argentinian army controlled the Aconcagua area until 1980 and imposed many restrictions which were a likely factor in keeping mass numbers of visitors away until this point. In 1983, the area was declared as Aconcagua Provincial Park and the popularity of the region soon followed. During the first open season in 1983 nearly 350 people climbed Aconcagua. By 2009 the numbers of annual climbers had reached 3700, a ten-fold increase. It is thought that approximately 30% of climbers are successful in reaching the summit, the vast majority are young males in their 20s or 30s and over 10% of climbers are female.